My quest to find good sounding low profile microphones lead me to a custom microphone project that wasn't very difficult to make is very compact and sounds really good. Occasionally some music venues or musical events won't allow microphone stands to be set-up in the audience. Typically the venues don't want the clutter of the stands or sometimes there simply is no good place to put a microphone stand that doesn't interfere with audience and crew sight lines to the stage. So, I decided to find a pair of low profile but good sounding microphones that don't always have to be mounted on a bulky microphone stand. After listening to various recordings on the Live Music Archive, I bought a pair Audix Micro Series M1290 microphones. The Audix M1290 microphones are very small brass body professional microphones that are powered with 48v DC phantom power (right). 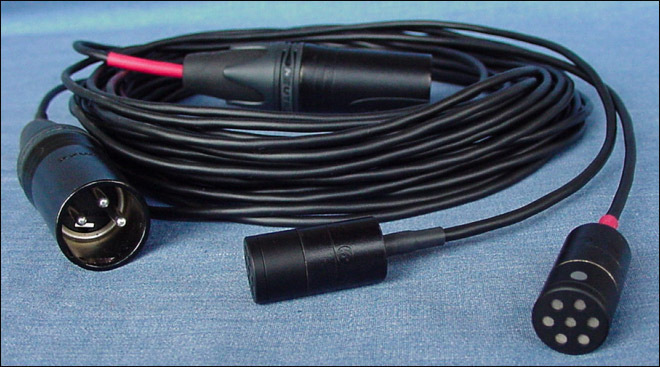 They come with cables that have standard XLR connectors on one end and mini-XLR connectors on the other end. They sound good, but after recording with them several times, I noticed that my Tascam DR-680 pre-amp got very hot on the bottom when I used the M1290's. I discovered that the Audix M1290 bodies need more current than the microphones I have been using. This higher current draw was possibly causing my portable microphone pre-amp to overheat. Since I typically like to run two or three pairs of microphones at a time I decided the M1290's were not going to work for me because of the pre-amp overheating issue. But, I really do like the sound of the Audix CPS-MICRO-O (omni-directional) capsules, especially considering how low profile they are at only 12mm in diameter. The Audix CPS-MICRO-O capsules have a nice frequency bump in the top end of the audio spectrum that makes them work very well for the diffuse field recording I do. So, I did some more research and found that there are brass housings available that the Audix Micro Series capsules can screw onto. They are often used by do it yourself microphone builders. The Transound TSB-120A (left) available from JLI Electronics Inc was just what I needed. It already has an integrated self biasing FET for high to low impedance conversion which makes it much easier to use for my application. I contacted JLI and bought four of the TSB-120A assemblies to experiment with. I purchased four because I hoped to find at least two FET's in the bunch that were reasonable well matched in output level. When the assemblies arrived and I tested them and I found they were all very closely matched, within 1 - 2db of each other. That was really good to see. Since I already had the great sounding Audix MICRO capsules that I bought from Audix, I decided to re-purpose the unneeded cardioid capsules that came with the STC-120A's. I decided to use them to enclose the back of the FET housings to make a nice looking slightly longer back end for the cables to exit. It was good luck for me that the FET housings have the same threads on both ends, so I could use the leftover capsule housings to cover the circuit side of the TSB-120A's. I removed and saved the Transound microphone diaphragms, screens and mounting rings and enlarged the center venting holes to make room for the cables to exit the housings. I then filled in the other round vent holes with auto body filler to seal the assemblies. After the filler dried I sanded the assemblies down and painted them black (right). I also changed out the stock 2.2k ohm source resistors with 4.7k ohm resistors to bring up the maximum SPL handling for loud music recording. 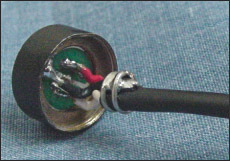 I soldered some small diameter lavalier microphone wire to the Transound FET housing and terminated the wire ends with an 1/8" TRS plug. This allowed me to use a Church STC-9000 portable pre-amp/ battery box I already have to power the capsules. I was very happy with the sound of this set-up. I made a couple of really nice recordings with it. But, I found I was using them stand mounted most of the time and I didn't like carrying around the extra pre-amp box. My next step was to eliminate the battery box/ pre-amp. Several years ago I owned a pair of modified Nakamichi CM300 microphones (Franken-Naks) that I powered with Naiant PFA's. The Naiant PFA devices lower 48v phantom power to 9 volts (plug-in power) and balances the signal line between the pre-amp and the capsules. The whole circuit fits in a standard XLR connector too! So, I contacted Jon O'Neil at Naiant and ordered a couple of his PFA's with 15 foot long un-terminated cables. On Jon's recommendation I removed the stock 2.2k ohm source resistors on the two left over FET housings I had. Jon recommended this as he said he could balance the circuit back to the capsules better with the source resistors removed. I then soldered the end of the PFA cables I received to the capsule/ FET housings (right). I shrink wrapped over the metal stop I fashioned with bell wire for strain relief and screwed the end pieces I had made out of the left over capsules onto the back of the FET housing. Below you can see the completed micro capsule active cables with a pair of Audix Micro Series CPS-MICRO-O omni-directional capsules attached. The completed project resulted in two 15 foot long microphone cables that I can screw the Audix Micro Series capsules onto and power with a standard 48v phantom power microphone pre-amp. The Naiant PFA's housed in the XLR connectors make it slick, because I don't have to carry around a battery box or plug-in-power pre-amp when I do low profile or open stand mounted recording with the Audix capsules. Duplicating this project will probably void the warranty on the Audix microphone capsules and is in no way approved by Audix or endorsed by me, Chuck Miller.